I was honored to introduce Convention attendees to the LWVUS incoming CEO, Virginia Kase. Since 2011 Virginia has been a leader at CASA, an organization at the forefront of the immigrant rights movement representing nearly 100,000 members. CASA is also the largest human service and civil rights organization fighting for social, economic, and racial justice in the mid-Atlantic region. Virginia has more than 20 years’ experience working in the non-profit sector and is a passionate activist and advocate for social justice. She starts in the national office on July 25. Please join me in welcoming her to the League! Convention delegates worked on several important business items while in Chicago, some of which are highlighted here. Delegates approved the proposed program of Making Democracy Work®, which includes Voting Rights, Improving Elections, Campaign Finance/Money in Politics, and Redistricting. Delegates voted to add advocating for the National Popular Vote Compact under the Improving Elections section of the Campaign. 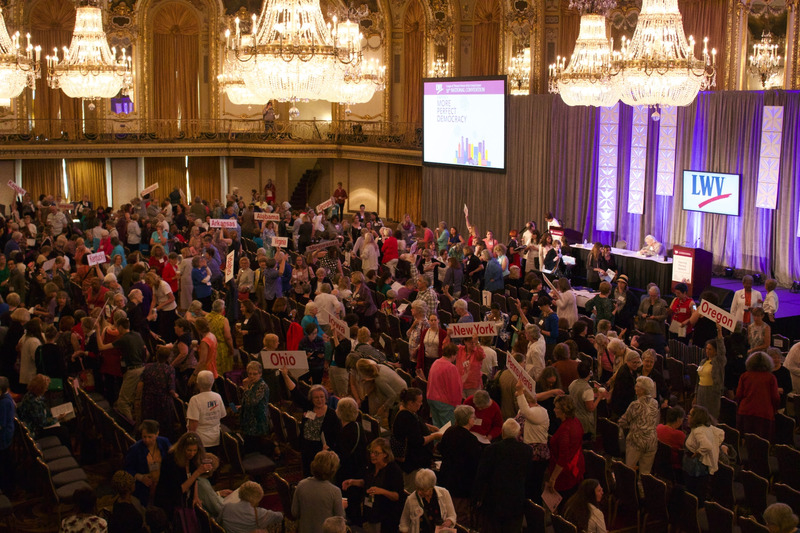 Delegates also voted for LWVUS to prioritize advocating for the Equal Rights Amendment (ERA) to be added to the U. S. Constitution. Convention delegates adopted the LWVUS budget for the 2018-2020 biennium. The Per Member Payment (PMP) rate will remain unchanged for the biennium. By acclamation, Convention delegates voted to elect the Nominating Committee’s proposed slate of new officers, board members, nominating committee chair and nominating committee members for the 2018-2020 biennium. Read the full Daily Briefings and view the photos from Convention. Host at least 10 voter registration events. Sign up as a National Voter Registration Day partner: nationalvoterregistrationday.org. Protect voters! Meet with local elections officials to discuss challenges & solutions. Host at least one candidate debate/forum. Publish an online voters’ guide on VOTE411.org. Get Out the Vote! Send election alerts to new registrants, volunteers, & partners. Respond to & share LWVUS action alerts. Fight for fair redistricting and encourage a complete 2020 Census count. Share your impact stories on social media and identify 5 key media contacts and communicate monthly. National Voter Registration Day is Tuesday, September 25! Sign up your League as a partner in this celebration of democracy. Simply host or publicize a registration event in your community on 9/25.Join thousands of organizations, elected officials, celebrities, and other partners—including hundreds of participating state and local Leagues—by signing up today!The League has been the single largest on-the-ground partner for NVRD since 2012. Let’s keep up the trend! In her first interview as incoming CEO of LWV, Virginia Kase tells Glamour magazine that what she saw the first time she voted makes ballot access a very personal matter. • "A convention could threaten the Bill of Rights itself." LWVCO president Toni Larson explains more in this op-ed. The League of Wake County is advocating for the ERA, saying, "Something as fundamental as the rights of half of the population should not be subject to the legislative whims of the day." This spring, the League of Palo Alto hosted an event to discuss the ability for electoral misinformation, disinformation, and fake news to undermine democracy. Read more about what policy, academic, and technology experts had to say, and what you can do to help. The U.S. House failed to pass the so-called compromise immigration bill before the July 4th recess. LWVUS will continue to monitor future efforts by Congress and the Administration on this issue. We remain committed to activating the LWVUS Lobby Corps and our grassroots activated when the need arises. League members are encouraged to get involved with local partners and coalitions in their communities. Two new tool-kits are available on the League Management Site. Visit the Census Action Kit and the Redistricting Action Kit for tools and resources— including templates, messaging guidance, and background materials—related to the League's work on redistricting and the Census. Additional materials will be added as they become available. This week national staff launched the new League Management Site (LMS) on LWV.org, replacing the old forum site. Any links you have from the forum site will now redirect to the League Management Site content. Staff worked with League leaders at every level to reorganize the content into the categories of: Manage Your League, Communications, Mission Impact Tools, and Governance.Watch a short demo video (no audio)about how to navigate the new LMS. If you have any questions about the new League Management Site, please direct them to communications@lwv.org. The state and local League pages on LWV.org now connect directly to the member database, so roster managers can make updates, such as correcting League website links, or update the names and contacts of the League leaders. LWV.org will then update that information every 24 hours. Any questions on updating this information can be directed to rostersupport@lwv.org. The Ruth S. Shur Fellows (or national coaches) are a part of the support network provided to participating state and local Leagues through the Membership and Leadership Development (MLD) Program. The Fellows will mentor and build relationships with state and local League leaders around best practices to engage new members and volunteers, to employ a diversity, equity and inclusion lens, and to develop new leaders with the goal of furthering our mission impact work in communities throughout the nation. If you are interested in learning more about applying to be a coach, please contact membership@lwv.org. Special Notifications: Please don’t reply to this message. For additional information, contact the individual listed or visit our websites: lwv.org and the League Management Site. To help keep your members informed, consider forwarding this bi-weekly message. Want to sign up to receive this email? Use this form. Please note that this is an internal communication that provides both announcements and opportunities meant only for your members and League, as well as updates on important news and events.